I'm wishing all the luck and success you can possibly have with the hay - aLL that hard work deserves good fortune! 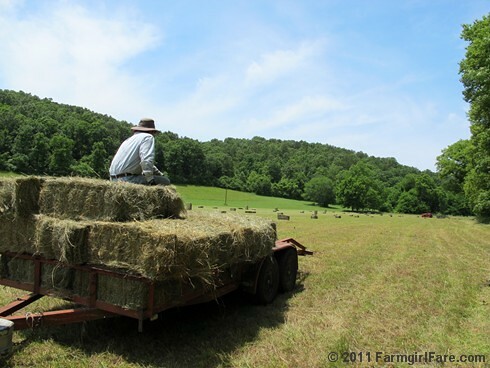 Make sure that the hay is not too green and that you have sufficient ventilation to dry the hay. A barn fire is not a pretty thing. We picked up 124 out of the field on Friday afternoon. We're getting some round bales today. Hay is a lot of work. We're still hoping that we get a cutting off our newly sprigged hay field this year. Hope you're getting to take some post-haying soaks in your Country Pool ;) Complete with champagne, of course.